The liberian Private foundation is a creature of statute. It is based on the best elements of the civil law foundations of europe, but adding unique Liberian features to create a modern, flexible and affordable private estate-planning vehicle. The Private Foundation is a separate legal entity that cannot trade but can hold assets such as corporations, trusts, bank accounts, investment accounts, real estate, or anyother type of assets. The Private Foundation is the legal and beneficial owner of its assets. Unlike a common law trust, the intended beneficiaries of the Private Foundation cannot combine after the death of the donor (founder) to end the Private Foundation and sell the assets. The Liberian Private Foundation requires limited public filing, and does not provide for disclosure of the donor or beneficiaries. The Foundation’s operative documents, the Memorandum of endowment and Management Articles,are not filed in the Registry. 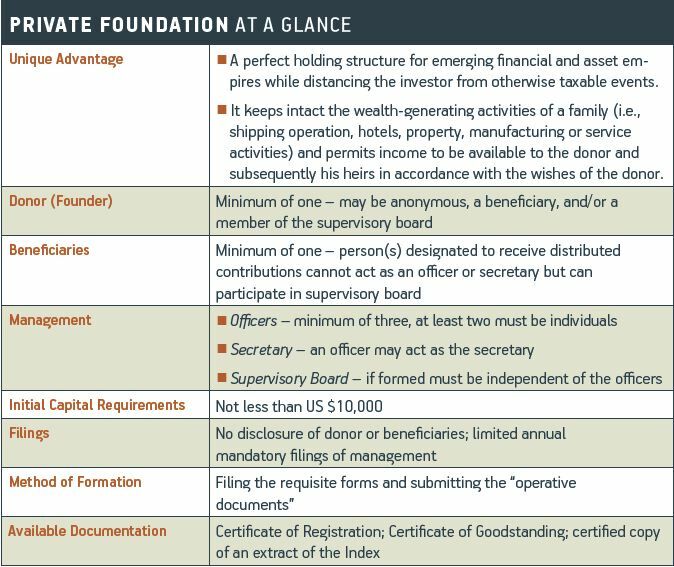 Officers, appointed by the donor, are responsible for the management of the Private Foundation and may be guided by a supervisory board. The donor has the power to remove the officers of the Private Foundation and direct the distribution of income from the Private Foundation. The donor can remain anonymous but can oversee the administration of the Private Foundation by appointing himself to the supervisoryboard. Officers determine distribution of income and capital in accordance with the donor’s instructions.